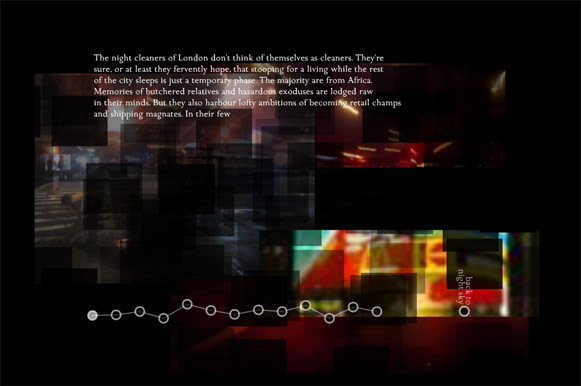 Elena, who is with us at the Proboscis studio under the Leonardo Da Vinci scheme, used a very eloquent excerpt from Night Haunts: A Journey Through the London Night by Sukhdev Sandhu, in her post accompanying the visual essay she is currently composing, Mapping The Streets. The book runs parallel with some of the themes we’ve been exploring for City As Material, particularly the notion of an outsider’s forays into a hidden landscape – in this case, ironically, a world normally veiled by the light of day. I immediately set out to buy it, but soon discovered it was available in full online, as it was originally commissioned by Artangel Interaction as a web project, with chapters, or “episodes”, released monthly. The website uses ever-shifting, distorted pixels and visuals as a backdrop and ambient sound paired with the text, both emanating an eerie nocturnal resonance, as the reader delves deeper into this insightful and poetic work.